Algore is now becoming Lizard Man!? 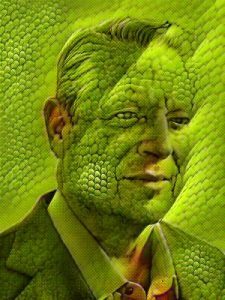 Lizarda, Brazil – While in South America giving speeches about Global Warming, Algore has reportedly begun changing into what appears to be a reptile. Local Brazilian newspapers are now referring to the Climate Change expert as “Homem Lagarto” (Lizard Man). Some believe that the warmer climate is changing the former vice president into a reptilian human lizard while others think he may have been bitten by a rabid lizard during a jungle camping expedition into the Amazon rain forest. Do you believe in Herpetology? Are you for or against Global Warming? Where do you see yourself in 100 years? Are you willing to fight for peace?